Climate adaptation strategies must address the unique cultural, as well as physical environments of communities. 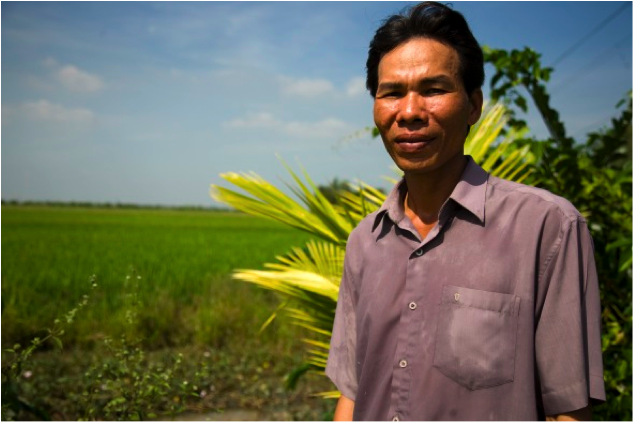 What is uniquely Vietnamese about the context for climate change adaptation? While there is much Vietnam can learn from global best practices, Vietnam also has much to teach as well. Given Vietnam’s history of overcoming wars, colonization, and natural disasters, what lessons can be learned from how Vietnam has built community resilience in the face of overwhelming challenges? Over the past two years, I presented five communications workshops with Vietnamese students, government leaders, and professionals to explore more story-based communications strategies around climate change to help Vietnamese practitioners share their experiences and learning with wider audiences. I held two workshops in Hanoi, Vietnam, at the Ho Chi Minh Academy for Politics (HCMA) and Public Administration and the Academy for Policy and Development (APD). In addition to these workshops, I also presented to three delegations of Vietnamese government leaders and professionals visiting Portland, Oregon. Addressing both current and future government leaders and planners, my workshops highlighted the role of vision and storytelling in building climate change adaptation using eight lessons from the Vietnam War. 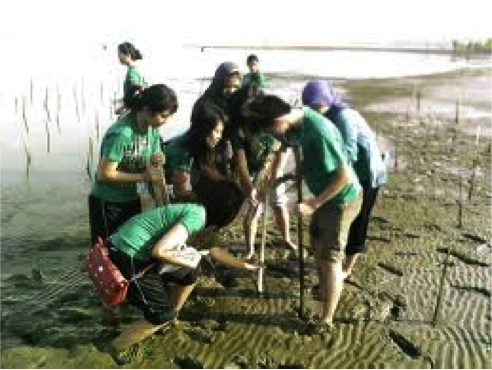 These volunteers are planting mangrove forests, which provide critical protection against typhoons and sea level rise. Work with nature rather than against it. Lacking high-tech weaponry of the U.S., the Vietnamese often relied on understanding the local environment to hide, or otherwise work with nature to hide and protect themselves from their enemy. Likewise, countries like the Netherlands are finding that traditional ‘hard infrastructure’ strategies – e.g. building dikes and sea walls – may not provide protection in a world with rising and variable sea levels. In addition, these hard structures often make areas more vulnerable because of associated impacts, and because they give a false sense of security. The Netherlands’ new “Room for the River” strategy reflects a fundamental shift towards working with nature, rather than against it. The voices of those most impacted need to be at the forefront of all communications. We need to cultivate leaders from all sectors of society, including farmers, students, and cultural workers. We need to look beyond just the “experts” to build a broad climate change movement. Look for leadership in all sectors of society. Vietnamese communications during the war emphasized that everyone, whether farmers, students, women, or young people, could contribute to the war effort. Climate change is an issue that extends beyond policymakers and scientists, yet currently, it is widely perceived as an issue that only “experts” are qualified to lead. In developing adaptation communication, emphasize the leadership roles everyone – youth, artists, farmers, college students, architects, veterans – have to play in building climate resilience. 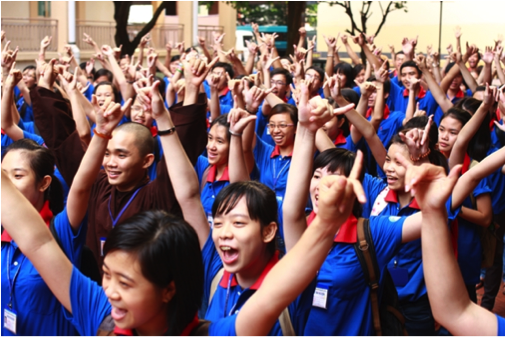 Some Vietnamese students suggested utilizing “Blue Summer” participants to engage in climate change adaptation. Blue Summer is a popular national program that engages Vietnamese college students in community service over the summer, often in projects far from home. Emphasize shared collective and family values: Values and emotion drive action. Solidarity and love of one’s country were powerful values that motivated many people’s actions during the war. Vietnamese people hold many strong values, including family values, collective values, and patriotism. Adaptation efforts should repeatedly and clearly emphasize their connection to these values, and frame climate change resilience-building as part of a long history of Vietnamese uniting to build community resilience to external threats. 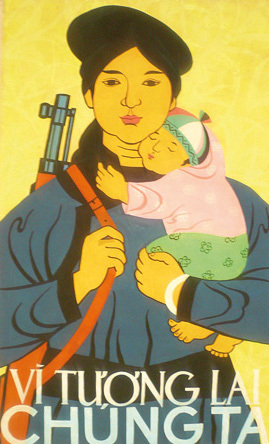 Use images and popular culture: Both in the past and still today, Vietnamese songs, posters, and sayings play an important role in shaping popular consciousness. Framing climate adaptation actions with these tools can help educate and mobilize people to take action to protect their communities. Provide a vision for the future: In the past, the Vietnamese government inspired people in the past with a vision of a united and prosperous country. Today leaders similarly need to put forward a vision for what climate change adaptation looks like. For example, providing a clear picture of successful river restoration that benefits city residents, farmers, and wildlife, will help citizens understand how their smaller actions make a difference for the long-term benefit of their community and their country. In the small-group activities that followed my presentation, participants brainstormed strategies for how they could use these principles to strengthen climate adaptation policies and plans. organizing community tree-plantings for people to see how their local actions can make their neighborhoods cooler during heat weaves. The responses to the training varied from person to person. Others sought clarification on the specifics of how these lessons from the war could be used to tackle climate change-related challenges. Workshop participants appreciated the recognition of Vietnam’s long history of collective action and resilience, but they are also focused on the future. Many of the government officials I spoke are focused on economic development, social stability and general prosperity. Targeting my workshops to address these concerns would help them more concretely be able to apply the things they learned in my workshop to their daily work. 2) The war metaphor is powerful and generates complex emotions. The framing of climate change adaptation as similar to Vietnam’s past wars was quite challenging for some participants. One group of participants explained that although they still feel proud when they hear certain songs from the liberation struggle, they also feel a lot of pain around the war, and don’t want to be reminded of the war. The metaphor of the war provided a new way to think about climate change, but evokes pain as well as pride and inspiration. More focus groups and in-depth interviews would be helpful to understand how best to use this powerful metaphor. 3) Understand the psychology of climate change communications: Given the absence of a clear human enemy and the gradual, long-term nature of sea-level rise and changes in temperature, many participants struggled to see how fighting climate change is similar to fighting a war. Following the research of psychologist David Gilbert, there are psychological barriers to climate action that make it difficult for people to see climate change as a threat demanding immediate action. Several psychologists and advocacy groups have shared strategies (see here, here, and here) for how to communicate about climate change that reflects an understanding of climate change psychology. 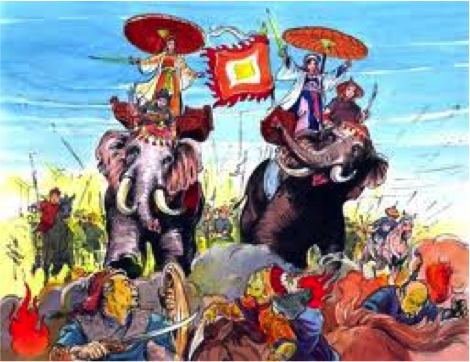 The Trung sisters are an important symbol of Vietnamese pride in their fierce, centuries-long struggle for independence. 4) We need to create a new Story for Vietnam, and a new Vietnam Dream. Other participants said that values such as solidarity and unity were no longer values that resonated as much with the Vietnamese in the post-Doi Moi market-oriented era. Many participants felt that new values in Vietnam focus on consumerism and individual/family prosperity. People seem to accept that some people will be hurt as part of the path to ‘development’ if it leads to a better future. The question is: how to make climate change adaptation part of the story and vision of a brighter future? 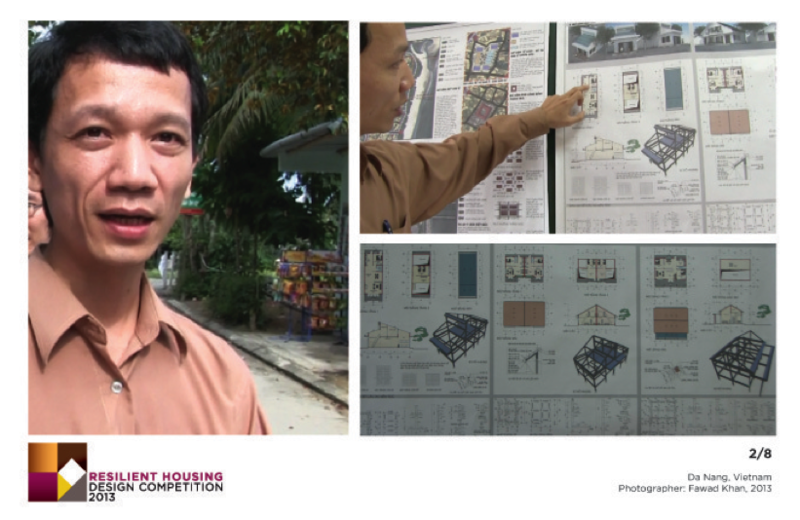 Climate change adaptation is not, ultimately, simply a set of strategies and technical solutions, but requires a collective vision and shared story of what kind of society Vietnamese want to build. Khanh Pham is a PhD student researcher at Portland State University. Her research interests are climate change adaptation and equity planning. She worked as a consultant with ISET in the summer of 2013, collaborating on an article of climate change adaptation “good practices” based on 10 global case studies and developed an annotated bibliography on urban planning and climate change adaptation.